Valentino Logo Script Bracelet - This one's on my wishlist but it's so beautiful and unique and defiantly a statement piece! Perfect if you want to splurge on a designer item from the sale. 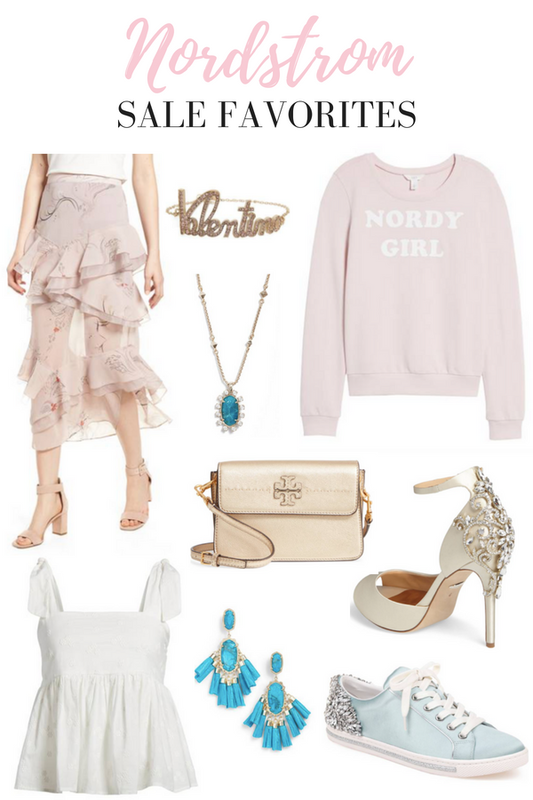 Tiered Chiffon Skirt - Almost everyday in Texas has been sunny and in the 90s and I've been looking everywhere for lightweight pieces that can still be worn to the office like this skirt. Plus it's so feminine and pretty! Nordy Girl Sweatshirt - I've been a huge fan of Nordstrom for years but this is actually the first time that I live close by a Nordstrom and probably go there at least 1-2x a week! ha so this sweatshirt is the perfect way to show my love for it. White Peplum Tank - I've been looking everywhere for a peplum tank like this with the bow straps and I had to grab this one which is only $25 and also available in black and yellow! Tory Burch Gold Metallic Shoulder Bag - I love metallics for the summer and this one is gorgeous and big enough to carry all of your essentials yet small enough to bring with you wherever you go. Kendra Scott Kristen Earrings - You guys know how much I love a statement earring and I always seem to gravitate towards aqua or teal ones cause they just look so pretty with a little white or black dress! Badgley Mischka Embellished Peep Toe Pumps - I adore the Badgley Mischka shoe line and the way they embellish all of their shoes, just stunning! I already this pair but I'm thinking about grabbing these since it's such a great deal and would look great for all of the weddings I'm going to this summer. Badgley Mischka Embellished Sneakers - I couldn't help but include these sneakers as well cause they're just so stunning and the perfect way to dress up when you're wearing a t-shirt and jeans. Also would be a great "something blue" gift for a bride-to-be! What are you loving from the Nordstrom sale? Or do you just get annoyed by the whole thing? LOL, I don't mind hearing the truth! Lol the Nordy Girl sweatshirt is so me! Thanks for sharing these picks. That white peplum top is my favorite! I love that Nordy Girl Sweatshirt! That's one of my favorite colors! i'm dying over the sneakers - so darn cute! I love your picks! There's soo many good ones - this sale is awesome! So many cute looks from the N-Sale! I especially love that white top! I am loving those sneakers! How freaking cute! I love your picks! Those heels are gorgeous!